ASTON MARTIN DB7 i6. FROM A 1999 YEAR MANUAL DB7 i6. BOOT FUSE BOARD AND RELAYS WITH COVER. FUSE BOX LABEL for ASTON MARTIN. (option A) A.M.V.8. 2004 Aston Martin DB9 2004 On 5.9 6 Speed Manual Petrol 2 Door Coupe Fuse Box All of our mechanical and electrical parts come with a 3 month warranty as standard, this covers the part itself but does not cover any labour charges incurred from fitment or removal of the item. (Terms and Conditions Apply). For extra peace of mind, extended warranties are available upon request at an additional charge. For more information please message us. Please be aware that all our items are removed from right hand drive vehicles unless otherwise stated. If you are unsure if this item will fit your vehicle or if you have any other questions then please call our parts department who will be happy to help. If you have any problems at all then please message us through eBay and we will happily help to resolve any issues. 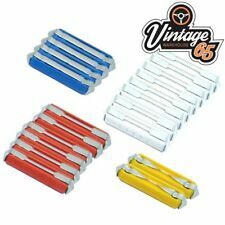 ASTON MARTIN DB6, DB6 VOLANTE, DBS, DBSV8 USED ORIGINAL LUCAS FUSE BOX COVER. PART NUMBER 37 120601 AC. 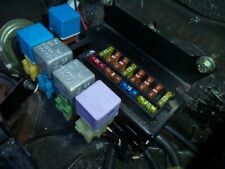 YOU WILL NEED TO ADJUST THE FUSES TO SUIT YOUR VEHICLE. IF THERE ARE PART NUMBERS IN THE ADVERT, THEY'RE THERE FOR A REASON. THIS MUST BE CHECKED PHYSICALLY AGAINST THE PART YOU ARE REPLACING. NUOVO originale Aston Martin principale nuova scatola dei fusibili. Note that all parts are used and will have signs of use and light scratches.Note that all painted panels are sold as needing respray. Removed from a 2005 YEAR. All parts are stamped & removal of the marks will invalidate your warranty. Aston Martin portafusibili. Genuine parte Aston Martin. Classic Car Part No. Unit Type Unit. _gsrx_vers_841 (GS 7.0.16 (841)). Make: ASTON MARTIN. Fuel type: Petrol. Year: 2012. All parts are stamped & removal of the marks will invalidate your warranty. We are unable to cover any labour costs. All of our Green parts are supplied with a 12 month warranty (Except Engines, Gearboxes, Transfer Boxes, Differentials, Tyres & Axles) unless otherwise stated. Here we have a set of 20 8amp Cereamic Fuse's for your Classic. Re-enforcing Plates Mounting Plates Child Seat Adaptors Seatbelt Extenders. Need Rear Belts to make the set?. Fusebox, Rear 4G43-14A073-AJ. Make: ASTON MARTIN. Fuel type: Petrol. Year: 2012. Body Style: Coupe. In the event that a part is supplied and proven to be incorrect or faulty, Hills Motors must be notified within 48 hours. PART NUMBER 37 120602 AG. IF THERE ARE PART NUMBERS IN THE ADVERT, THEY'RE THERE FOR A REASON. THIS MUST BE CHECKED PHYSICALLY AGAINST THE PART YOU ARE REPLACING. IF IT DOES NOT MATCH THEN IT IS MORE THAN LIKELY WILL NOT WORK ON YOUR CAR. NEU Original Aston Martin Hauptsicherungskasten NEU. Guter Zustand (siehe Foto). Wir weisen darauf hin, dass es sich um Gebrauchtware handelt. Informationen über den Verkäufer finden Sie auf der ". Used original AMV8 fuse box, 12 glass fuse type 095.037.0124 (situated in passenger side kick panel). FUSES NOT INCLUDED. 30AMP --- 2 PCS. MINI BLADE CAR FUSE SET. TOP QUALITY CAR BLADE FUSE SET. EACH SET INCLUDE 20AMP --- 2 PCS. MINI BLADE FUSES. MINI style fuses. MINI Fuses. 25 Amp (Silver) x 5. MINI BLADE FUSES. MINI style fuses. MINI Fuses. 2 Amp (Grey) x 5. MINI BLADE FUSES. MINI style fuses. MINI Fuses. 3 Amp (Purple) x 5. MINI BLADE FUSES. MINI style fuses. MINI Fuses. 4 Amp (Pink) x 5. Get Images that. MINI BLADE FUSES. MINI style fuses. MINI Fuses. 30 Amp (Green) x 5. Get Supersized Images & Free Image Hosting.